In this chapter, two dynamic models of offshore platforms and several required lemmas are introduced for investigating active control strategies in this book. In the first dynamic model, only the first dominant vibration mode of an offshore steel jacket platform with an AMD mechanism is taken into account . This model is utilized to design active controllers to attenuate wave-induced vibration of the offshore platform. 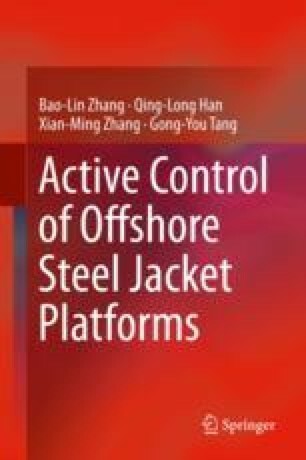 In the second dynamic model, the first and the second vibration modes of an offshore steel jacket platform subject to an active TMD mechanism are considered [65, 72]. By considering parametric perturbations of the system and external disturbance, several uncertain nonlinear models for the offshore platform are developed. Such models are used to design active controllers to reduce vibration amplitudes of the offshore platform subject to self-excited hydrodynamic forces and/or external disturbance.